(MPI) - On November 29th, 2018, at the headquarter of the Ministry of Planning and Investment (MPI), the 9th Ministerial-level Meeting between the MPI of Vietnam and the Ministry of Planning of Cambodia under the co-chairman of Deputy Minister of MPI Nguyen Van Trung and Secretary of State Hou Taing Eng. Speaking at the meeting, Deputy Minister Nguyen Van Trung expressed his delight at the achieved cooperation results between the two countries' investment and planning sectors over the last years. This result has contributed to the socio-economic development of each country and strengthened the traditional friendship, comprehensive, lasting cooperation relationship between the two countries. At the meeting, the two sides exchanged socio-economic situations of each country and a number of measures to contribute to enhancing the cooperation effectivity in the coming time, at the same time, the two sides reviewed, exchanged and agreed on a number of tasks to strengthen cooperation between the two countries' Ministry of Planning and cooperation activities in 2019. Secretary of State Hou Taing Eng highly appreciated the assistance of Vietnam’s Expert Team for training Cambodian Ministry of Planning’s staff on the skill of calculating GDP in some Cambodian provinces and he expressed gratitude to Vietnam for providing 3 billion VND aid package to support the survey and data collection to calculate GDP in four Cambodian provinces in the Cambodian - Laos - Vietnam Development Triangle Area and some Cambodian provinces contiguous to Vietnam. At the same time, he expressed gratitude to Vietnam for developing software to calculate GDP for some provinces of Cambodia. Both sides are pleased with the results of expert teams of the two countries' Ministries of Planning on negotiating and finalizing the "The Common Agreement Framework on Linking Vietnam - Cambodia Economies until 2030", which was signed on July 21st, 2017 in Phnom Penh, Cambodia on the occasion of a state-level visit to Cambodia by General Secretary of the Communist Party of Vietnam Nguyen Phu Trong. 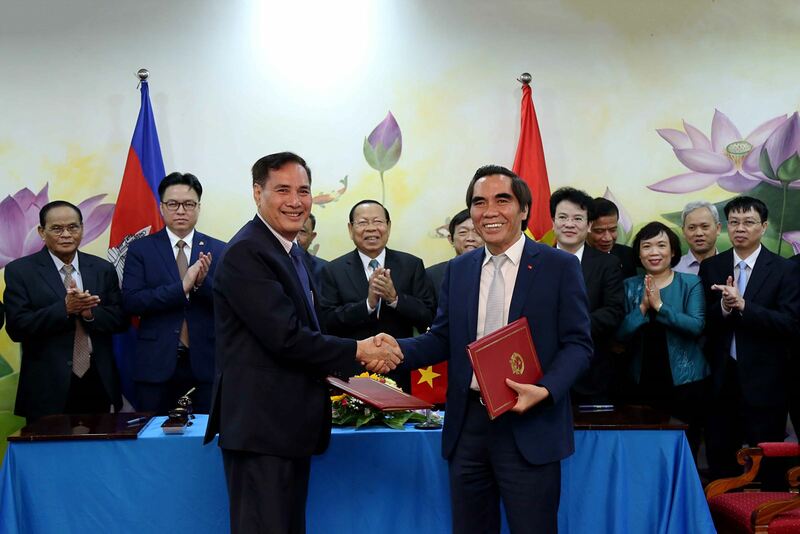 At the same time, the two sides agreed to authorize expert teams of the two countries’ Ministries of Planning to implement development of the "Master Plan for Linking Vietnam-Cambodia Economies until 2030" as mentioned in the Framework Agreement. 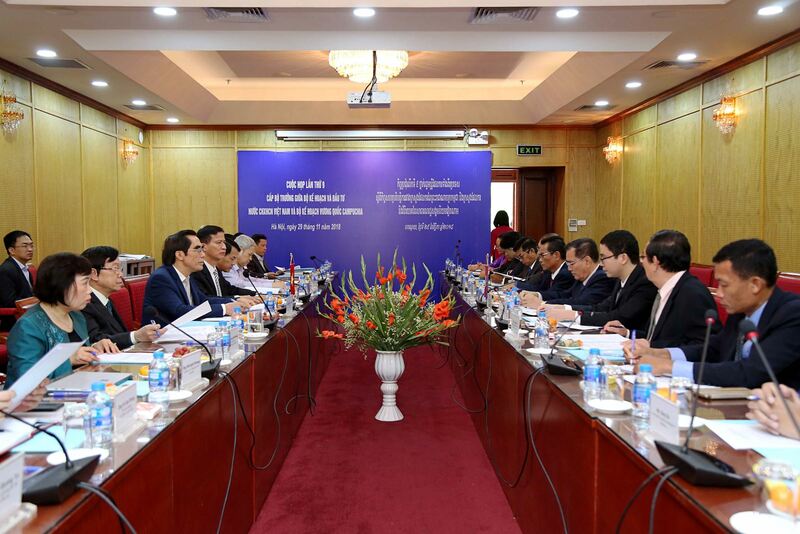 At the meeting, authorized by the two Ministers, the Deputy Minister and the Secretary of the State signed the Minutes of the 9th Ministerial level Meeting between the Ministry of Planning and Investment of Vietnam and the Ministry of Planning of Cambodia./.